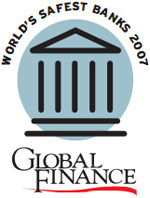 Global Finance selects the world’s safest banks, the 50 institutions with the highest ratings from the leading international credit ratings agencies. Images of customers queuing to withdraw their savings from Britain’s Northern Rock bank this September sent a shudder through the world’s banking industry. As a result, more than any time in recent years, investors are looking for reassurance that their banks will not fail. 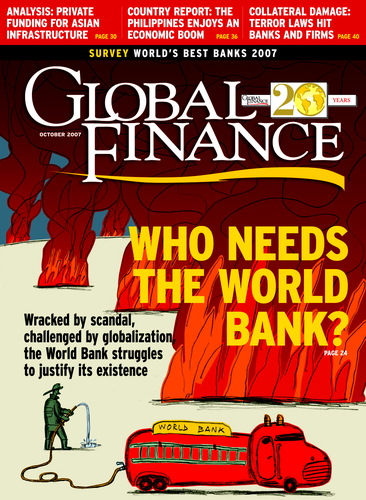 Global Finance’s annual ranking of the world’s safest banks is a good place to start looking. French group CDC takes the top spot for the fourth year running. Perhaps ironically, in a year where it became notorious for its key role in the mid-year financial meltdown, fellow French bank BNP Paribas makes its first appearance among the top-10 safest banks. The world’s biggest bank by assets, Britain’s Barclays, which last year had for the first time scrambled past local rival Lloyds TSB and Switzerland’s UBS, has tumbled back down, as the other two banks saw their Moody’s rating rise to Aaa. Wells Fargo yet again provides the only US showing in the top 10, edging up to eighth from last year’s 10th. The US, though, still has the strongest presence overall, with seven banks in the top 50. The UK is right behind, with six, followed by France with five. Germany, which used to dominate the safest banks rankings, has just three banks in the top 50—although Deutsche Bank jumped to 23rd from 39th last year. Meanwhile, Australia and Canada strengthen their positions, with four banks each on the list. Spain’s BSCH—Santander—continues its relentless rise, leaping from 30th last year to 16th this year, having enjoyed upgrades from all three ratings agencies in the past year. As always, we have constructed our ranking based on size and credit quality. We began with a pool of 500 of the world’s largest banks by asset size to which we applied ratings from Fitch Ratings, Moody’s Investors Service and Standard & Poor’s, with appropriate weightings. Where banks were rated equally by all three ratings agencies, the largest of the banks was awarded the highest ranking. The safest banks chart compares the ratings for the world’s 50 safest banks, based on long-term foreign currency ratings from Fitch Ratings and Standard & Poor’s and the long-term bank deposit ratings from Moody’s Investors Service. Where possible, holding companies have been rated rather than subsidiary banks, and government import-export finance institutions have been omitted. Within each rank set, banks are rated according to asset size. Ratings are reproduced with permission from the three ratings agencies, with all rights reserved. A rating is not a recommendation to purchase, sell or hold a security, and it does not comment on market price or suitability for a particular investor. Because Moody’s uses different ratings from the other agencies, equivalents are shown in the table on the right.